Often you hear people say “I didn’t quite have the day I expected” – and usually it means that they had a bad day. Well, I had a day that I didn’t expect to have, but for the reason that it actually went better than I expected it to. On the face of it, it looks like I had a great result on very little training. But there is a bit more to it than that, and is a good illustration of what I call a “high priority focus strategy”. Basically, in a nutshell that means I only do the most important things, and pretty much ignore everything else. In this case, that meant highly focused bike training, race-specific run training, and no swimming. Why did I decide these things? The bike is my strength, and after taking the whole of December off, my FTP was very low and I was not in good biking shape. This would mean that unless I fixed it, my bike would become a liability instead of a strength. 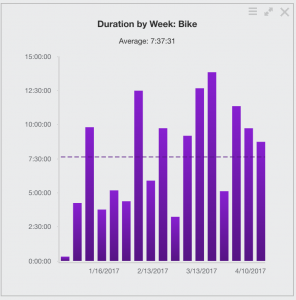 So regardless of my race schedule, I focused on getting back into biking shape, initially just by starting to bike regularly. This year I’m taking a different approach to my run training. Instead of building up a base of high volume easy running, I’d be doing two race pace workouts a week and the rest easy. Race pace being Ironman and 70.3 race pace. I figured that with 2 x Ultramans under my belt in 2016, I already had a solid foundation of slow running in place and I would be better served by focusing on “weekly miles at race pace” instead of just “weekly miles”. As for the swim, I didn’t see any value in spending many hours in the pool, only to gain 3-5 minutes in an Ironman. So I basically did no swimming (until I decided to enter IMTX, more about that below). I entered Ironman Texas with 10 days to go, with the goal of doing it as a big supported training day. I’d been considering the event as a part of my schedule but hadn’t actually pulled the trigger. I was focusing the first part of the year on the race weight experiment, where the goal was weight loss and NOT performance. I was almost certainly NOT going to race IMTX. However, during the final 3 weeks of that project (the cake phase), I saw some surprising performance improvements (even though I was not losing weight). My FTP jumped from 281w to 313w, which is a much bigger increase than usual. Granted, 281w is a much lower starting point than usual, but it had been sitting around that level since January with no improvements (which is to be expected when you’re at a constant calorie deficit). That performance gain was a signal that I would at least be able to perform on the bike at IMTX at a reasonable level. With a few long training rides, I could get into shape relatively quickly. My run shape was ok, but I’d done no long runs. Everything was shorter stuff like 8 x 1 mile repeats @ around 6:45 pace. Certainly not my typical “Ironman training”. I hadn’t run longer than 14 miles between January and April, with a low (but consistent) weekly mileage of around 22 mpw. The main difference with my run training this year is that I have fewer long slow runs, and more medium length runs done at race pace. And a few runs with long slow warm ups, a middle part faster than race pace, and a slow cool down. As for swimming, there was pretty much zero. I averaged 1500m of swimming per week, way off the usual 15-20k per week that I do when training properly for an IM. So with 2 weeks to go until race day, my biggest concern was the swim. My swim shape was terrible – on Monday 10th April my 100s were at least 15 seconds slower than what I would consider “race ready” (on some I was struggling to come in on 1:40 which is slow for me) and my 200s were coming in at about 3:25 instead of the 2:55 that I would expect when in good shape. The positive side was that my swim form usually returns quite fast, so my theory was that with 10 days of solid swimming I would be in good enough shape to get through the swim without totally falling apart. I aimed for 4k of swimming per day, every day until the race. On some days I only had time for 2.5k, but on those days I would focus on short, hard reps (like 25s, 50s and 100s), making best use of the time I had available. By Friday 14th April, I felt in good enough shape to join the masters group at CAC Boulder, but I downgraded myself from my usual 1:30 lane to the 1:40 lane because I was not fast enough. I managed to make it through that workout to the end (which was an accomplishment) and then I did 2 big swims over the weekend. On Monday 17th I joined the masters group again, but this time in my normal 1:30 lane. My form suddenly returned and I was hitting 2:45 for my 200s and 1:22 for my 100s. This was very reassuring for race day and I knew that I would be ok on the swim. So my *best case* expected times for the race was around 1:05 swim, 4:40 bike and 3:30 run, purely based on how I had been feeling in training. I posted this on our Triforce community group, and one of my athletes (Fred) said he’d send a nice bottle of Brunello if I broke 1:05 on the swim! I’d be thinking about that a lot in the Woodlands Lake! I did not taper at all. I just didn’t have the fitness base to justify it. I knew there would be 2 light days before the race due to travel, and I accepted that I could be fresh enough with that short break. I would have lost too much fitness had I tapered for longer, and I think it was the right decision. Diet wise, I aimed to be at a calorie surplus, and with carb heavy distribution, in the final 2 days before the race. During those days I also do a few short but hard workouts that help to accelerate the glycogen storage. I’m not going to lie, there is nothing I love more than eating a ton of carbs! Not something I get to do very often, and is probably part of the reason I love racing! This race was also a chance to test out some new gear (literally new gears). I’ve been experimenting with a 1X chainring setup and it worked fantastically. I used a 56t front chainring, with an 11-40 cassette. However I didn’t need all those gears and never went higher than the 21t on the back. 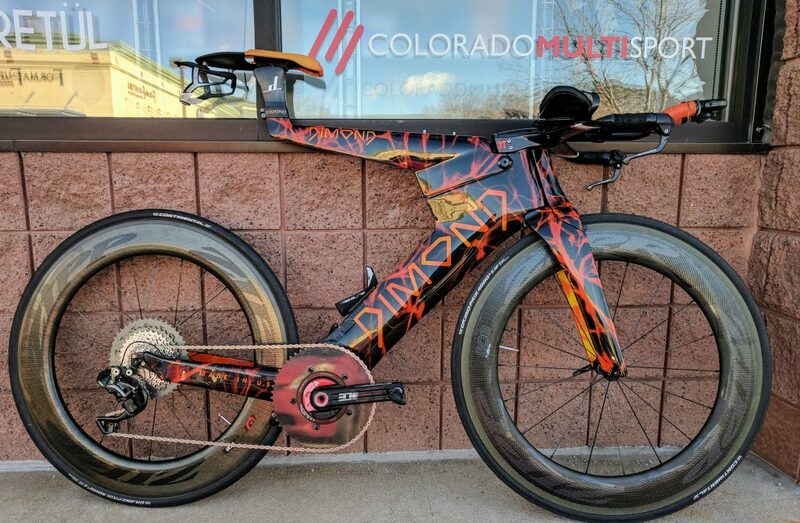 But, I will most likely need all those gears for IM Boulder, so I was really just testing that whole setup, and I was pleased with the outcome. My workouts on Thursday and Friday before the race were ok but I didn’t feel on top form. I felt a bit heavy and lethargic, like I do when I’m adapting to a big training block. My hope was that I would come around just in time for race day, so I didn’t worry too much about it. After all, my goal was to just have a big, fully supported training day out there, so I wasn’t overly concerned about being totally tip-top-race-ready. For once I got a really good sleep the night before, and I woke up fresh and ready to go. I drove down and found a parking spot at 4:55am, thinking that most people would aim to arrive at 5am. It was a good call – I got a parking spot really easily, and then 5 minutes later all these cars turned up at the same time, all looking for parking while I chilled out listening to some pre-race tunes. I headed over to T1 and set up my nutrition, pumped my tires and then started the rather long walk to the swim start. This distance should not be underestimated. I thought it was about a mile, but it seemed to take forever to get there. I left transition just after 6am and only got to the start about 3 minutes before the pro men cannon went off (I’m guessing around 6:30?). I quickly dropped of my bags and then went through to the front of the swim start group, about 4 rows back. It was non-wetsuit, and I felt I would swim about 60 minutes, based on my rapid improvement over the previous weekend. A few minutes later the cannon sounded, and we started moving into the water. The weird thing is that I didn’t see a timing mat on the water’s edge. Usually with these rolling starts, they have a timing mat there, so your time only starts once you get into the water. They seem to have counted the gun time, not the chip time, which explains why my official swim time was about 15 seconds slower than my garmin swim time. I’m not sure if this is actually what happened, and I hope it is not, because that would mean that the people at the back of the line would be getting falsely slower swim times than they should. I felt quite good during the swim, and everyone around me looked like good swimmers, which is usually a good sign that I’m having a good swim. I went through 2km in 30 min flat, so I thought I was well on track for my 60 min time and securing that bottle of Brunello. However we then turned into the canal, on the way to the finish line, and that just seemed to take forever. I exited the water in 1:04:45, plus about 10 seconds to get to the timing mat, and I crossed the line with a garmin time of 1:04:58 – 2 seconds to spare for Brunello time! Of course due to the whole gun-time vs chip-time thing, I was actually 2 seconds slower than Fred’s Brunello Benchmark, but I’d only found that out after I finished. T1 was super smooth. I pulled on my sleeves and put on my helmet as I ran to the change tent, so the only thing I had to do once in there was take off the bottom part of my swimskin, and grab some nutrition out of the bag. I took one Glukos gel (they are nice and liquid so no need to wash down with water) and I put a pouch of Powerbar energy blasts (200 calories) down the front of my top. I saw Derk (one of my athletes) right behind me. He usually swims 58/59 minutes, so I felt better about my 1:05 swim. Little did I know he was thinking the same thing about me. So basically we were both feeling reassured by our mutual poor swim performance! Derk ended up going sub 9, so his swim didn’t matter much after all. Anyway so I got my bike, ran down the muddy field, and hopped on at the mount line with no issues. I rode easy for the first 5 minutes while eating the bag of cola blasts, adjusting my sleeves and various other housekeeping tasks, and then got down to the business of riding! As per usual, I attracted “Kona guy” – that’s one of those riders that muscles past you with a grimace on his face (sometimes out of the saddle sprinting) and then slows down in front of you. You then pass him, and he doesn’t want to be passed, so he passes you again and then slows down. And so on and so forth – those of you who’ve raced Kona know that guy. Eventually I just let him go past and I sat 12m behind him until the 50 mile mark. The effort felt too easy for me, but it was less taxing than playing a ridiculous cat and mouse game for a few hours! Once we got to the far turnaround, I put down the gas a bit and dropped him, and then I was alone for the rest of the bike. I knew I was doing ok when I was only seeing FPRO and the occasional struggling MPRO (like fellow Ultraman Peter Kotland). After I got off the highway for the final 7 miles, I could see a group of riders ahead of me. At first I thought it was the front of the AG race, but when I finally passed them it was actually the front group of female pros. To avoid a drafting penalty I had to take the whole group in one shot, which was a pretty hard 40 second effort. A bit further up the road I passed eventual female winner Jodi Robertson, who was riding quite hard and seemed extremely comfortable. With the course being a bit short (110 miles), T2 snuck up on me unexpectedly – I went around a corner and suddenly it was there. Since I hadn’t looked at the course at all, I had no idea it was there, so I hadn’t unclipped my feet yet. That made for a slightly awkward dismount, but I sorted it out quickly and made my way to the empty change tent. I got my run stuff on quickly and headed out the tent. Jodie blitzed transition, and exited about 20 seconds ahead of me. I was aiming to start at 7:45-8:00 pace, but went through mile 1 in 6:50. It felt super easy so I just stuck with it and continued to run by feel. One by one the female pros ran past me – it was fun to watch their race unfolding in front of me and I could see right away which ones were going to run well. By mile 10 my average pace was 7:24 – and I was momentarily tempted to shoot for a sub 9. With a rough mental calculation I figured that 7:30 pace average would get me done around 3:15 and sneak under the 9 hour mark. But somehow my special needs stop slowed me down a bit and by 11 miles my average was around 7:40. So I just resumed my goal of treating it as a big training day and continued running by feel. By the way, the special needs was worth it, with a Starbucks Frappucino waiting for me there (it’s good cold, it’s good hot too, so a win-win no matter what the weather!). Derk passed me at around mile 11 and he was looking great! He ended up running 3:01 – the slacker couldn’t find another 90 seconds somewhere!??? 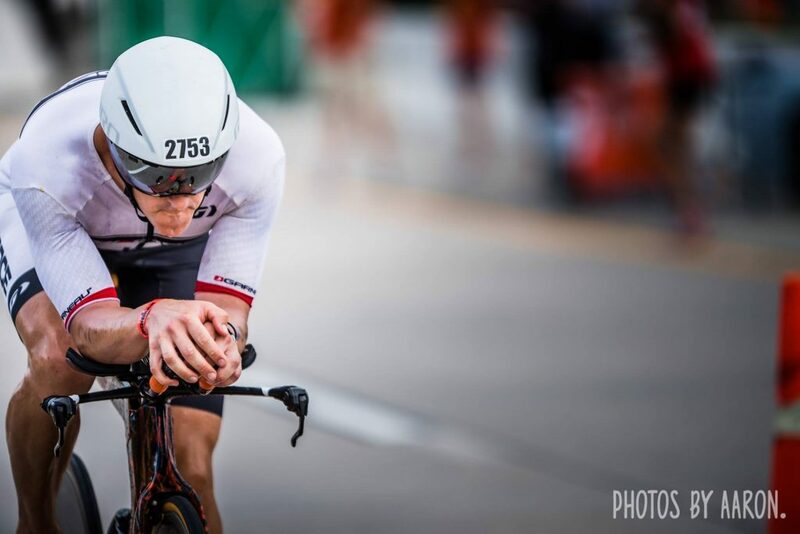 Although he might say the same about my 4:31 bike split… but on a serious note, it’s so rewarding having an athlete that you coach outperform you on race day, in fact so much more than performing well yourself. For the rest of the run I just hung in there and tried to keep moving forward at a relatively slow run pace. I was just happy to not be walking, especially given my lack of long runs. The Woodlands run course is now one of my favorites. Ok it’s on concrete path for most of the time, but the route varies a lot between running through shaded woods and along the crowd-dense canal path, and there is so much support! One of my Ultraman athletes (Amy) was out volunteering so I got to see her multiple times which was fantastic. I also saw her hubby John a few times – he was at this area called catapult corner which is just an insane part of the course – so much crowd atmosphere you can’t help but the “catapulted” through there. Just before the finish, I saw Brian, another of my athletes who was on his second lap. I was happy to see him looking strong and I knew he was going to make it. There was a little doubt a few weeks back when we was struck with illness for 3 weeks, but he pulled through on the day and made it in for a strong finish. They say a bit part of endurance racing is the mental aspect, and I have to say that racing Ultraman set me up to be able to finish this race on much less training than I should have done. My total quad failure at Ultraman Worlds was still fresh in my mind, so any discomfort I experienced during the IMTX was inconsequential compared to that. By comparing the pain in my mind, IMTX seemed really comfortable, whereas before I think I would have experience it as a much higher level of discomfort/pain. Crossing the finish line, I had no idea what place I was or what my time was, but I thought I was somewhere in the top 7 or 8. It was therefore with huge surprise that I discovered that I’d finished 3rd. With 10 slots in M40-44 (which ended up being 11 with a re-allocation) I had made my 5th year consecutive KQ with a surprisingly low degree of preparation on the face of it. However, as I said if you dig a little deeper, you can see the benefit of FOCUS. 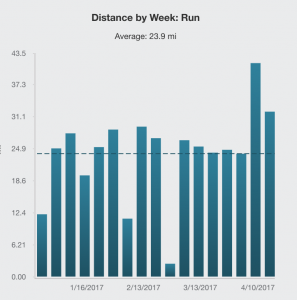 From January through April, my focus was heavily on regaining bike fitness, and focusing run training almost exclusively on race pace. Pretty much zero swimming, because for me the difference between swimming and not swimming is about 5 minutes. But with the bike focus, I was able to comfortably lay down a great bike split and set myself up for a comfortable KQ with a relatively average run (I’d say to KQ in 40-44 you should at least be able to run a 3:30). In fact everyone in the top 10 of the AG (except me) ran under 3:25. I was obviously very happy with this result. I felt I executed very well and on top of that it was a great training day. Next IM will be Boulder in June, which will be a chance to experiment with a few more things. Right now, I’m thinking of doing a focused run block and seeing where that gets me for Boulder. Plus, of course, my swim has now come back (even though the IMTX result doesn’t reflect that) so I will maintain it by swimming almost every day. Race week: no low carb like I usually do, mainly because I didn’t taper, and I needed to support my training load right up to the end. So high carb and pretty healthy food. Big carb load Thursday and Friday, with a decent proportion of my newfound carb load food “Angel Food Cake”. Day before race day, I had the traditional burger and fries but no beer this time (didn’t feel like it). Race day: Oatmeal (pre soaked night before). Bagel with almond butter and honey. 4 x Ensure shake (not all at once). No food after 4:30am up to race start at 6:40am. T1: 1 x Glukos gel sachet (they are great, no need for water). 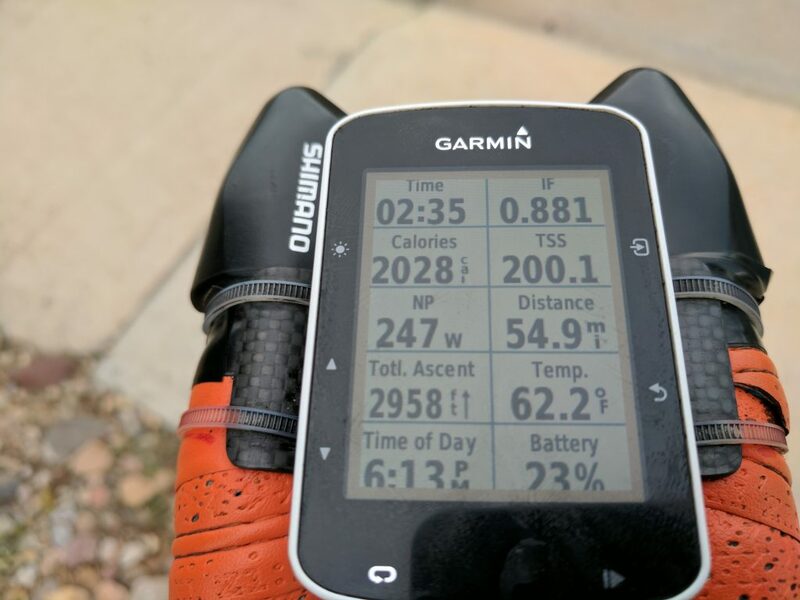 Bike: 2600 calories (4.5 hours). About 570 per hour (probably 550 once you account for spillage). Glukos energy drink, Powerbar cola blasts, 2 packets black forest organic gummy worms (in Boulder it is well known that organic gummy worms are much faster than regular ones), and then my big calorie mix of maltodextrin, fructose a50 nd ginger beer. All liquids in Torpedo and CX Chrono bottle on the downtube. Run: 650 calories so 185 per hour. I’m not really able to take in much more than that while running. Glukos energy shots, Glukos energy tabs, Glukos energy gels, and a Starbucks Double Shot Mocha drink (in a can from special needs bag). Since I finished the race weight project a little earlier than expected, and since I experience some very good performance gains the the final 3 weeks of cake-eating, I decided to pull the trigger and enter Ironman Texas (April 22nd), as a big training day for Ironman Boulder in June (11th). This will be an interesting exercise in “Just in Time” training. Basically, I’ve maintained my bike and run with regular training, at a level at which I can just launch into an Ironman build at short notice without any issues. This “base” is not very time intensive. In fact my weekly hours between January and April has been under 11 hours per week. Most of that has been biking and running, since my swim volume has averaged 1500m per week (for comparison, my normal swim volume training for an Ironman is 15-25km per week). My longest run before I entered Texas was 14 miles, and most rides were not longer than 2 hours. So with 2 weeks to go, I had a bit of work to do, especially on the swim. 1500m per week just really nothing, and my swim was in terrible shape. Last Monday, I was struggling to swim faster than 1:35/100m for short intervals (like 100m) and my 200m intervals were coming in at over 3:20. My strategy was to swim every day, as far as I could before my form would break down, building up to where I could manage 4000m easily. 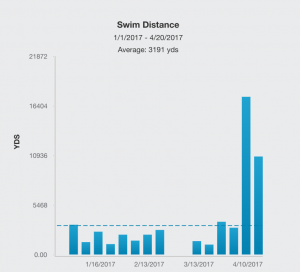 That took about 7 days (17k of swimming), and by this Monday (April 17th) my swim was back on track. My 100m intervals were down to 1:22 and my 200s were down under 3 minutes, under 2:50 if I swam hard. Plus I could get through 4k of swimming in one session with not too much fatigue. So we’ll see how race day goes, but I’m confident that I will at least make the distance. Biking has been going well. I haven’t done any long bike rides (4 hours max, with a few 3 hour rides). But my power is good, so expect a decent bike split at Texas. I’m guessing it will be under 5 hours but I’ve never raced there before so I’m not sure. Best case 4:40, worst case 5:00. Running is a bit of an unknown. No long runs at all, although I got in 18 miles last Friday. I feel my pace is where it needs to be, but not sure about my endurance at all. On race day I will just start with a run/walk structure (9 min run, 1 min walk) and see how things go. I expect I could run a 3:30 marathon if everything goes well. Probably more around 3:45, but I really just don’t know. But whatever happens, I will be there with quite a few friends, and two of my coached athletes. So just being there for a big supported training day will be fun! Ok so after 3 weeks of cake, I am finally done! 3 weeks is a bit too long for losing 1kg, so clearly I enjoyed it a little too much…! It could also be that as I’m nearing a low weight, the weight loss rate slows down a bit, but I think it’s safe to blame those baked goods for the slow progress. On the plus side, I experienced some very good performance gains in my training, which was definitely not expected. My FTP (Functional Threshold Power on the bike) increased from 281 watts at the beginning of this project to 313 watts by last week. That’s only about 15 watts less than my all time best. My run also seems to be in reasonable shape. My swim is not, but that is mainly because I have not been swimming at all (maybe a topic for another post?). Anyway all this performance improvement is a good thing, and I would certainly always give up rapid weight loss if it means my performance will increase. But as I’ve said before, it’s best to focus on one or the other, I just happen to have got lucky getting a performance increase while on a weight loss project. As you can see though, weight loss was almost non existent while my performance was increasing. So, the main project is done! But, it’s also not done, because I’m interested in seeing what happens now that I return to normal eating, with a focus on training performance. That means higher calories, with healthy foods that help to support my training and recovery. It is about time, since bizarrely I have been craving salads and vegetables! 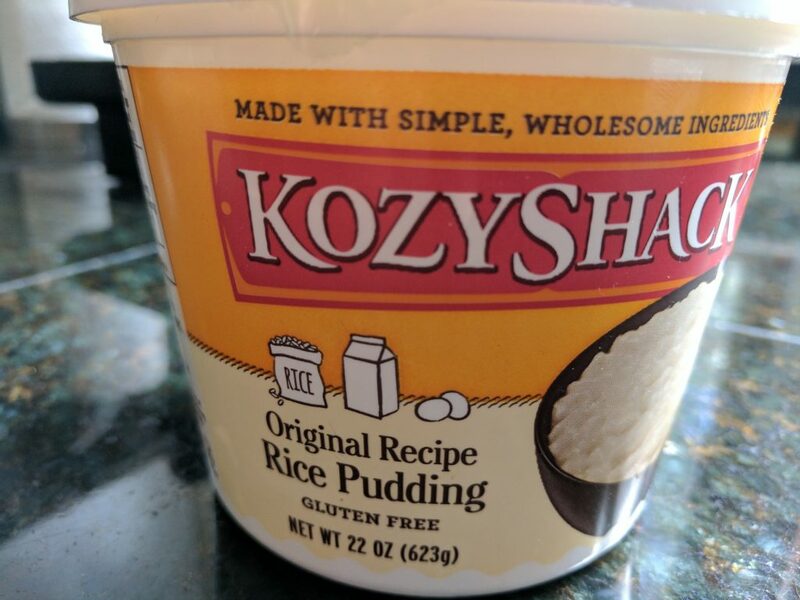 I will also throw in some experiments along the way – at some point I really want to see if that rapid weight loss I experienced in the ice cream phase was just coincidence due to the timing of ice cream within the project, or because the calories are very predictable, or some other reason. I did not expect that at all, so it will be fun to repeat it and see what happens. In other news, I decided today to enter Ironman Texas (which is in 2 weeks time). That will be an interesting experiment because I have not been doing any real Ironman training. 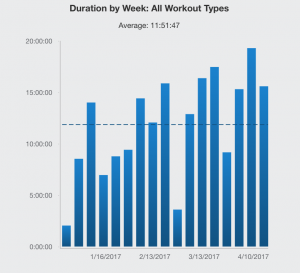 Between January and April I averaged under 11 hours training per week, with only 22 miles of running per week and 150 miles of biking per week. My average swim distance is 1500 meters per WEEK!!!! That is a 10th of my “normal minimum” of 15k per week when training for an Ironman. So, I will definitely be able to finish the race, but I’m treating it as a big training day. I will not be competitive at all. I think I will just survive the swim, I’ll do quite well on the bike, and I will do as well as I can on the run, maybe a 3:30 marathon is not out of the question. Probably closer to 3:45. So possibly an overall time of 10:15-10:30 depending on how things go. I’ll be doing some last minute Ironman training this week, and won’t taper at all for the race, so at least I will arrive fit(ish) but not very fresh. Either way, it will be fun to race with some friends and have a good time out in the Woodlands on April 22nd! One great discovery I made during cake phase, was Angel Food Cake, which is pure carb (both complex and simple carbs) and no fat at all, so I will be incorporating this into my carb load for sure! Plus some burgers and ice cream the day before race day – my secret weapon!!! Also, when I get some time, I will do a post with a recap of the whole race weight project. Lately I’ve been pretty busy so I need to squeeze in the time to get that done. Ok so we are two weeks into cake. And it’s been a lot of fun – maybe too much fun! 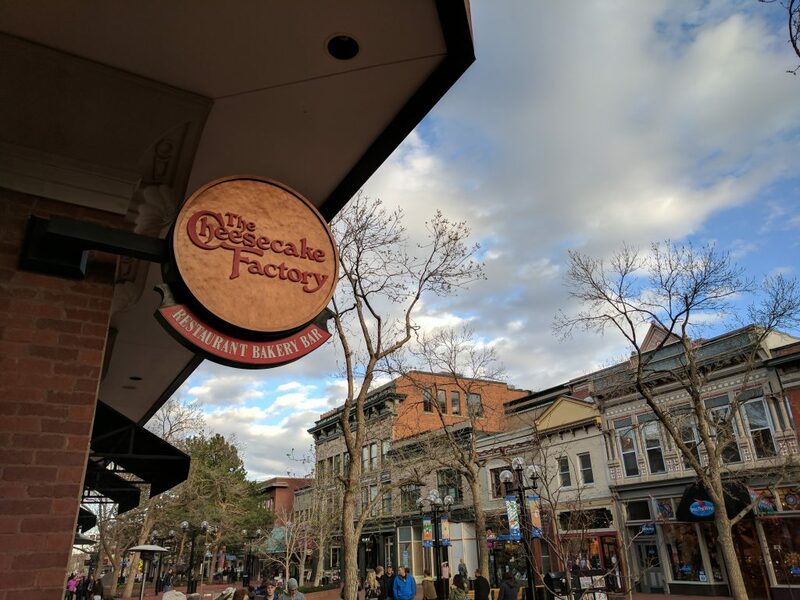 I’ve managed to gain 1kg, but that gain came with a benefit… First of all, last Monday I did an 8 mile run in Breckenridge up to over 10,000ft elevation, without a severe degradation in run pace. That’s the first time ever that I’ve had a good run at high altitude. Secondly, I did an impromptu FTP test during my Thursday ride and had an unprecedented 30+ watt increase in FTP compared to my last test this year. My working theory is that the weight gain and performance improvement go hand in hand. There is no proof of that, and there are a lot of variables, so it really is just a hypothesis. The one “experiment within an experiment” that I’ve done with the cake phase, is to “eat back” my burned calories. That actually introduces a lot of room for inaccuracy, because measurement of exercise calories is not super accurate. It’s reasonably accurate, but if you burn 3000+ calories in a day, even a 10% variance can impact your weight loss goals significantly. So as counter-intuitive as this sounds, it can actually be easier to lose weight if you don’t do a huge volume of training. That way you just set a daily goal (in my case 2200 calories) and add nothing back in for exercise. However, if you’re training a lot, you need to fuel and recover in order to support that training. My plan is to add calories back once I am no longer focused on weight loss. That way, a gain of 1-2kg here and there is no issue when your focus is on performance, because your priority is on fueling your workouts and your recovery really well. That’s where food quality AND calories become very important. Usually, in that “performance phase” I focus on food quality, but don’t pay enough attention to getting in enough calories. So I will still track calories, but the focus is on making sure I eat enough. I’ll be doing some trial and error to nail down the numbers that I use. In a way, this last 2 weeks has accidentally helped me to define that. I used a baseline of 2200 calories and added back ALL workout calories, so I’ll start with that when I begin to focus on performance. I also learned that during the weight loss phase, it’s a mistake to add back ALL workout calories. I’ve actually lost the most weight when training the least, but sticking to a specific number each day and not adding any workouts back in. It just simplifies everything and (for me anyway) seems like a very good strategy. 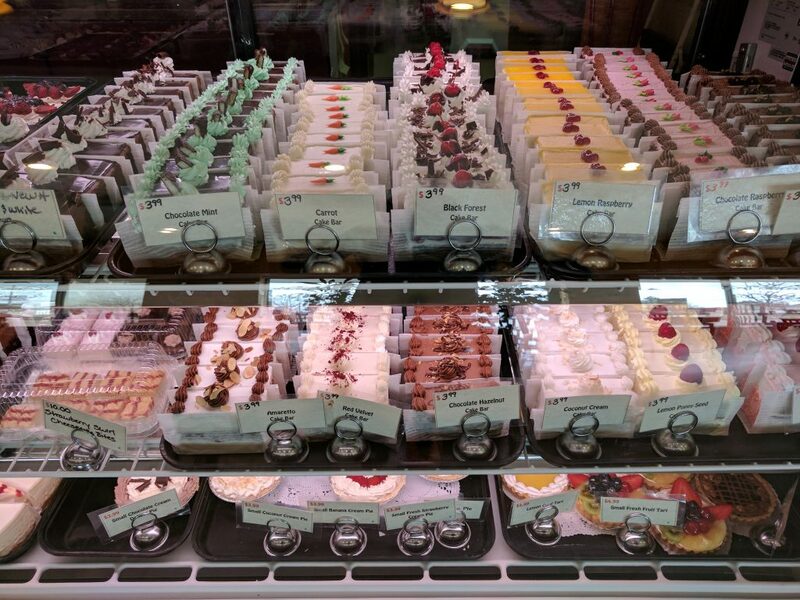 So the plan for the next 2 weeks: stay on cake (yay!) but don’t add any calories back. If I have a particularly taxing workout (like a 4 hour ride), I will just fuel that workout itself at around 300 calories per hour, but not add the exercise calories or the workout calories back in. In a way, I like the fact that this experiment has had a few surprises and things that didn’t work as expected. All of that helps me to learn more about what to expect and be able to tweak my “real life” nutrition and training accordingly. So the longer term view is to get to 73kg on cake, then focus on performance and training for a while and just see where my weight settles (without letting it get much higher than say 75kg). And then at some point I really want to try the ice cream phase again to see if I can repeat that rapid weight loss phenomenon I noticed during this project. I’m mostly expecting that it was just coincidental with the timing of the project phases, but it would be really awesome if it works again! Neva Road Eastbound is nice and fast with a great surface. You can take the turn from 36 at full speed and the first corner can be taken in aero. Nelson Road climb is about 4 miles. It’s a grind and you’ll probably have a headwind, but it’s not steep. Maybe 4% grade. Try to stay in aero, especially on later laps when you’re tired – that’s when you need to be aero. Sitting up into a headwind is the worst thing you can do. Having said that, there are some little kickers along Nelson that may be sheltered from the wind, where you can sit up briefly to get some relief from being in aero for so long. St Vrain Rd starts with a fast descent and two blind corners, but they can be taken at full speed. However, on laps 2 and 3 this section will be congested so please be very aware of other riders. There is one pothole on the flat section of St Vrain road but hopefully they fix it by race day. 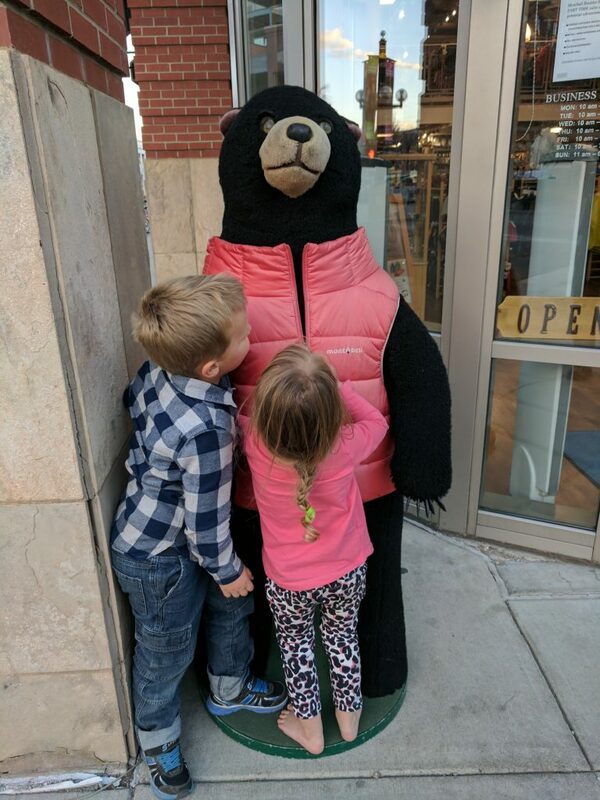 Posts have been a bit sporadic as we’ve been up in Breckenridge on a short ski vacation. 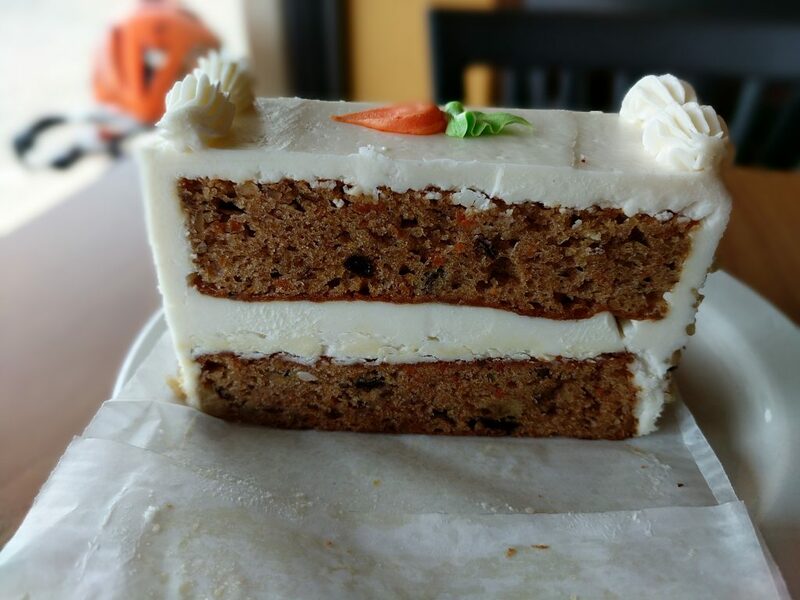 It has been remarkably difficult to find cake up there, so I tweaked the diet to include anything that’s been part of it before. 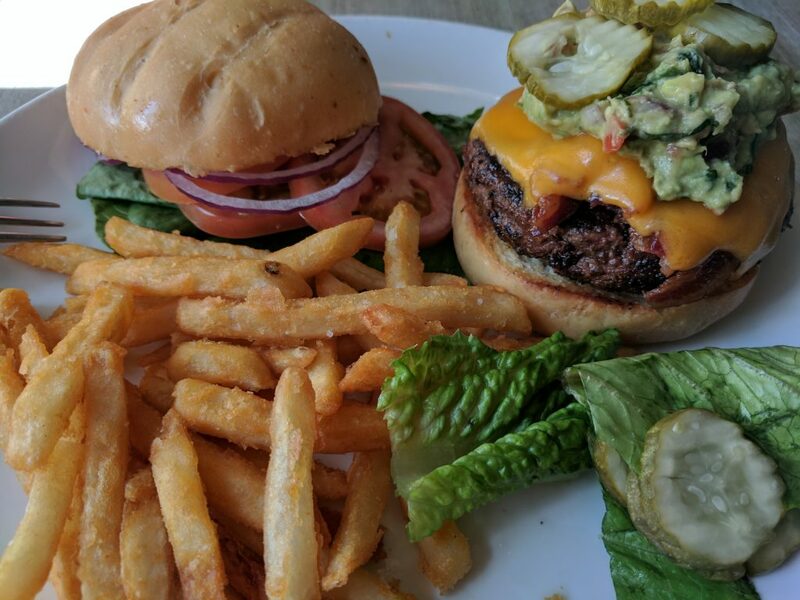 So I got to partake of a very good burger at Blue River Bistro which is a great little restaurant in Main Street Breck. I did manage to get hold of some ice cream sandwiches too, but they were just boring Klondike Vanilla Ice Cream sandwiches, which were very middle of the road and bland. 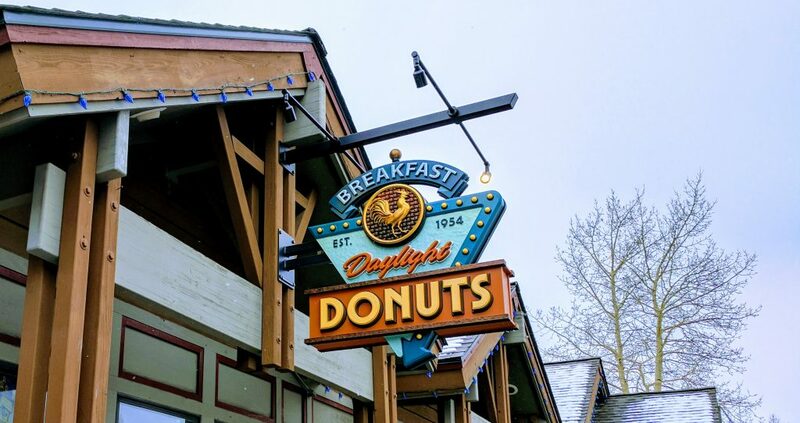 I found two donut shops but they were never open… go figure. From a workout perspective, I had a surprisingly good run. I say surprising because it was at an altitude of 10,000 ft (peaked at 10,300ft/3140m) and I managed to hit 7:45/mile average on an 8 mile negative split run workout. The negative split was “designed”, by running the first 4 miles uphill and then back down for a total of 8. So not really the same as doing that on the flats. But anyway, usually my runs at an altitude this high are really slow, so I was happy with the performance. I should be able to get a weigh-in done by the end of the week. 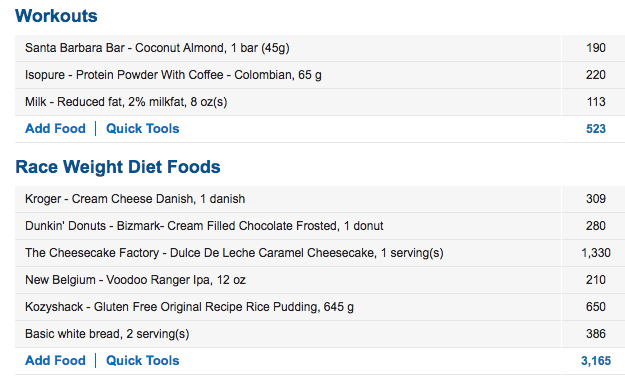 Due to the super high quality of my recent workouts, I’m guessing that I may have not been restricting calories enough. However I’m ok with that 1) it’s great to get some decent workouts in after 7 weeks of reduced calories and compromised training and 2) because I would love to continue eating cakes for a few more weeks. The red velvet cheesecake was very good. I would highly recommend it. But I have no idea how one might fit that in after a meal at cheesecake factory. On it’s own was enough for sure.